This holiday season, in addition to unique shopping opportunities, visitors to historic downtown Galveston can enjoy a free holiday event called “Lasers, Lights and Magic in the Park.” During Thanksgiving weekend on Saturday, Nov. 30, Saengerfest Park, 2302 Strand, hosts the 2nd annual Lasers, Lights and Magic in the Park Celebration. The park will transform into a holiday spectacle with music, a special appearance by Santa Claus and twinkle lights synchronized to music, all culminating with a holiday themed laser light show. As an added touch of magic, periodic flurries of snow will blow through the park in tropical Galveston. Festivities begin at 6 p.m. and are free to the public. Lasers, Lights and Magic in the Park continues through New Year’s Eve on Tuesday, Dec. 31. Visitors can enjoy a holiday themed 15-minute laser light show daily at 6 p.m., 7 p.m. and 8 p.m. at Saengerfest Park. On Saturdays and Sundays, with the exception of Dickens weekend on Dec. 7 and 8, Santa on The Strand returns from 1 to 5 p.m. for photos at Santa’s Workshop. Additionally, the Galveston Holiday in the Park Choral Concert Series will take place on Dec. 14-15 and Dec. 21. Local choir groups and bands will perform at Saengerfest Park from 12 p.m. to 6 p.m. followed by a 15-minute laser light show at 6 p.m., 7 p.m., and 8 p.m. The holiday light show is free and open to the public. 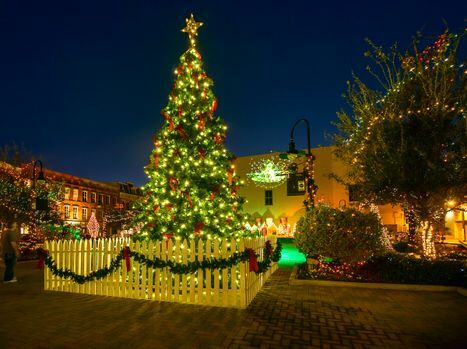 Lasers, Lights and Magic in the Park, Santa on the Strand, and the Galveston Holiday in the Park Choral Concert Series are part of Galveston’s Passport to Holiday Magic, a two-month celebration of more than 1,000 holiday events. Lasers, Lights and Magic in the Park is presented by Mitchell Historic Properties, the Historic Downtown Strand Seaport Partnership and the Galveston Park Board of Trustees. For more information, call (409) 762-0062. Mitchell Historic Properties (MHP) oversees Galveston properties owned by the family of developers, philanthropists and preservationists Cynthia and George Mitchell, including commercial and residential properties located downtown as well as three hotels – Hotel Galvez & Spa, The Tremont House and Harbor House Hotel and Marina at Pier 21. MHP owns and preserves approximately one-fourth of the buildings in The Historic Strand Seaport Area. For leasing information, visit www.MitchellHistoricProperties.com or call (409) 763-5806. Galveston Island is the No. 2 tourism attraction in Texas for in-state and out-of-state travelers. Galveston is a historic beach town located just 50 miles south of Houston, Texas – the fourth largest city in the U.S. A diverse cultural town, Galveston Island is a unique destination offering 32 miles of beaches, a variety of family attractions and resorts, one of the largest and most well-preserved concentrations of Victorian architecture in the country and Texas’ premier cruise port. For more information on Galveston Island, visit www.galveston.com or call (888) GAL-ISLE.